1 Comment Posted November 5th, 2009 . November is a great time for composting – the sudden influx of pumpkins and leaves will make your backyard pile a happy place. If you’ve been wanting to start a compost pile, now is definitely the time. It’s like you can actually take Fall and stuff it in your pile! Take those pumpkins, break them up, and fold them in. Rake your yard before you mow, and toss all that goodness in. Edge your yard and gardens, and toss the trimmings in. Clean the Summer out of your garden, and throw it on. If you’re going big, ask some neighbors for their pumpkins and leaves. Our pile was looking very happy after Halloween. Happy composting! 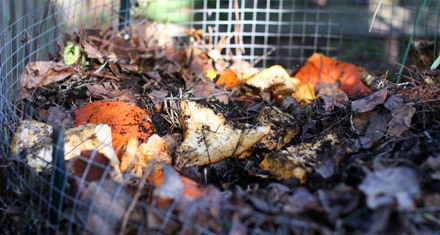 Composting Update :: Tis the Season! Composting Update :: Got Brown? Composting Update :: We Have Steam! Composting Update :: Now with Starbucks!